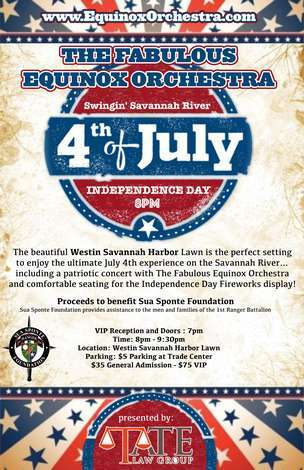 The beautiful Westin Harbor Lawn is the perfect setting to enjoy the ultimate July 4th experience on the Savannah River including a patriotic concert with The Fabulous Equinox Orchestra and comfortable seating for the Independence Day Fireworks display! Proceeds from this event go to support the Sua Sponte Foundation. The Sua Sponte Foundation is a nonprofit organization that was created to provide assistance to the men and families of the 1st Ranger Battalion, part of the U.S. Army’s elite 75th Ranger Regiment.